Jambo Creek was the first place in Manitowoc County to be settled by Europeans. In 1795 Jacques Vieau, recently appointed an agent with the North West Fur Company, was tasked by the company with establishing trading posts along the western shore of Lake Michigan. Born near Montreal, Quebec, Canada, Vieau was heavily involved in the fur trade in the Western Great Lakes region. Left: Historical marker designating the location of Jacques Vieau's cabin. Right: Monument honoring the bicentennial of Vieau's arrival in the area. His mackinaw boat, loaded with goods that would be traded for furs with the Native Americans, landed at what is now Two Creeks, Wisconsin. From here he proceeded inland, on an Indian trail, nine miles southwest to a site in close proximity to Jambo Creek Park. He was accompanied by his family in this endeavor, traveling in a large bark canoe with a full outfit of gear for living in the wilderness. Later, Vieau built a “jack knife” trading post (that is, a trading post that would only be manned during the fur trading season) on Jambo Creek, followed by another in Manitowoc Rapids, as well several more all the way down to what is now Milwaukee. There he established a warehouse and log cabin, where he spent his winters. This log cabin has become recognized as the first home in Milwaukee. 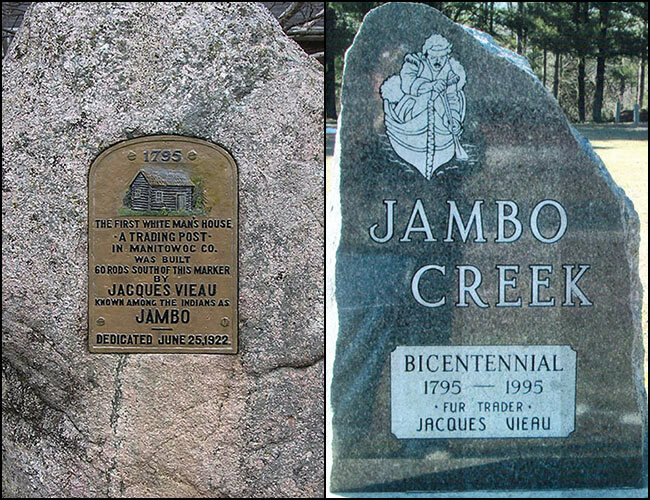 The name “Jambo” is the Native Americans’ pronunciation of the French fur trader’s last name, Vieau. The Jambo Creek trading post was located on the Old Green Bay Trail. This trail started as a Native American trail route along the western shore of Lake Michigan, connecting the area at the southern end of the lake (present day Chicago) with the southern end of Green Bay (the present day City of Green Bay). It would later be developed into a roadway by early European settlers. Vieau's son-in-law, Solomon Juneau, who took over operation of Vieau's trading post in the Milwaukee region around 1818, would go on to found the City of Milwaukee. The Mishicot Sportsmen’s Club was founded in 1947 and has always been very active in the community. The Village Park was originally established by the club in the late 1940s, eventually being turned over to the Village in the early 1960s. It was at this time the club purchased the land now known as Jambo Creek Park. Jambo Creek Park is roughly an 18-1/2 acre tract located in the Town of Gibson, which is just northwest of the Village of Mishicot. 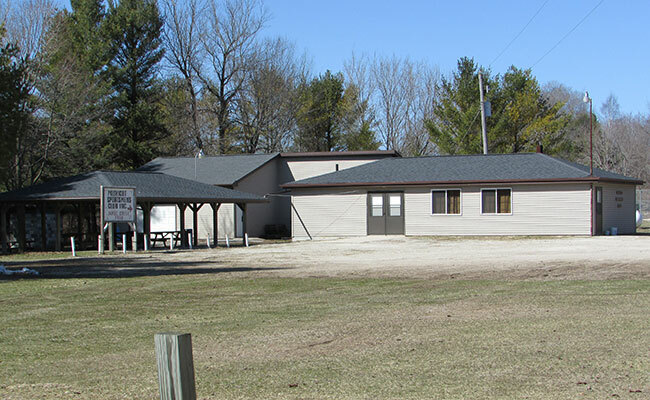 Mishicot Sportsmen's clubhouse at Jambo Creek Park. Jambo Creek is a Class II trout stream. In addition to fishing, the Park offers facilities for picnicking, hiking, and archery. There is a field archery course for bowhunters and other archery enthusiasts to use. The clubhouse is available to be rented by members and general public for weddings, graduations, class reunions and many other events. Falge, Louis, editor. History of Manitowoc County, Wisconsin. Chicago, IL: Goodspeed Historical Association. 1912.